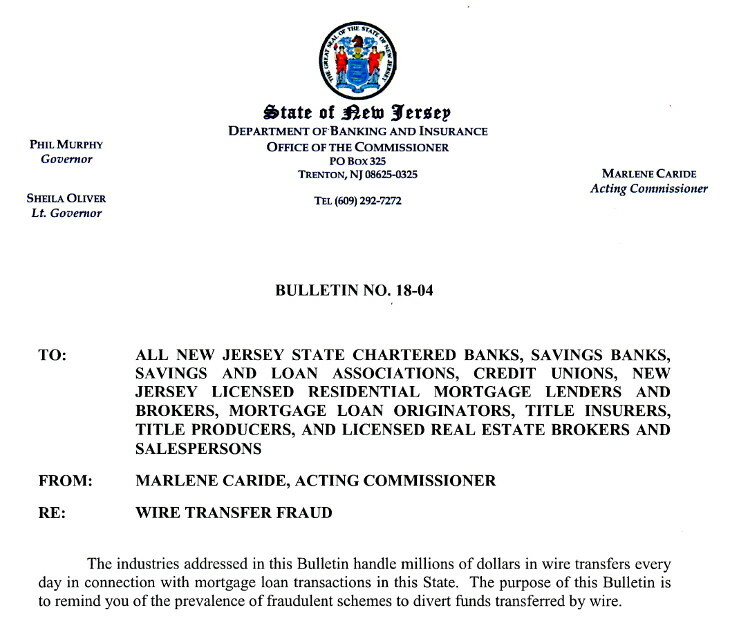 TRENTON PA – Wire transfer fraud “can have a devastating effect on consumers and other parties involved in the financing of real estate transactions,” New Jersey Department of Banking and Insurance Commissioner Marlene Caride said during April 2018 in issuing a two-page bulletin on the topic. Caride reminded “all licensees to be vigilant and diligent when handling or arranging wire transfer transactions.” She asked licensees to familiarize themselves with the bulletin and “exercise all reasonable care with such transactions. An image of a portion of the bulletin appears below. Clicking on the image will open an Adobe Acrobat copy of the bulletin in your web browser, which can be downloaded to your computer and read or printed for your convenience. This item is reproduced by Polley Associates as a public service for its students or others interested.